The Online Portal is an easy, fast, and secure way to pay rent and other charges online, view your payment history, and submit maintenance requests. Access your Online Portal from any mobile device. This video demonstrates how to navigate the Online Portal and how to use all of the features included. You must call your bank and issue a stop payment. 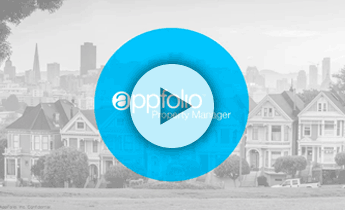 Neither AppFolio or your property manager has authority to gain access to your Online Portal or bank account to stop the payment on your behalf. The same is true for an auto payment that has processed for the month. Can I edit or delete my scheduled auto payment? Auto payment details are displayed on the Home or Payments tabs in the Scheduled Payments section. Click Edit in this section to change the payment name, amount or account information. To change the date the payment is processed each month, click Delete, then return to the Home or Payments tabs to create a new auto payment. Click Delete to remove the auto payment completely. eCheck payments are free to you, but there is a non-refundable online portal convenience fee for a Credit or Debit card payment. This is in place to comply with current card network regulations. You are notified of the fee amount when you select the Credit or Debit card payment option, and are given the option to switch to eCheck. The online portal convenience fee is a fixed, flat amount based approximately on your monthly rent amount. We take privacy and security seriously and invest in state of the art systems to protect payment information. A dedicated team monitors the security of our platform and infrastructure 24/7/365. All sensitive data is encrypted both in transit and at rest. Our security is regularly audited by third-party reviews. Security is baked into our software development lifecycle. You’ll receive an Online Portal Activation email or text message from your property management company. Click Activate Nowin the email, or tap the link in the text message to establish a strong password to activate your portal. Bookmark or create a shortcut icon for the login page so it is easy to return at any time. You will receive a confirmation email once your portal is activated. If you see a message stating you cannot make online payments, please contact your property manager as this is a service they can choose whether or not to offer their tenants. Once logged in, you will land on the Home tab where you can view your current balance owed and details of current and future charges broken down by month. Click Pay Now to make a one-time payment, or Set Up Autopay to create an automatically recurring payment. You have two options of payment methods. Select eCheck (direct withdrawal from bank account) or Credit or Debit Card. eCheck payments are free to you, while Credit or Debit Card payments carry a non-refundable online portal convenience fee that is added to the total of your payment. See the FAQs for more information about these fees. Pay Now – Continue through the steps to submit a payment directly to your property management company. You will receive a confirmation email once the payment is successfully submitted, although this does not mean it has cleared your bank account yet. If you do not receive a confirmation email, you did not fully complete all necessary steps to submit the payment. Set Up Autopay – Continue through the steps and specify the account, date, and amount to pay (specific amount or balance in full). You cannot schedule an auto payment to begin the same day. You will receive a confirmation email on the day the payment is submitted each month. 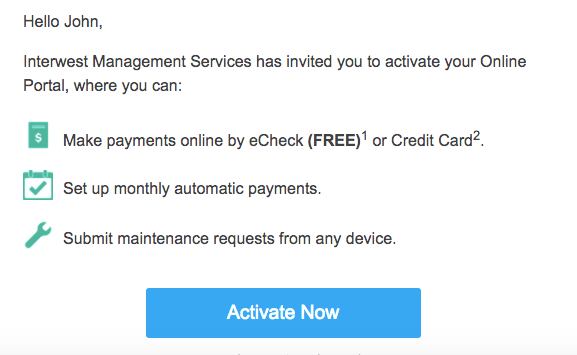 *Please note, once an auto payment is submitted for the month you cannot make changes to it. These instructions help you update the details of the auto payment that is submitted each month such as amount and date. Once your auto payment is set up, the details are displayed in the Home or Payments tabs in the Scheduled Payments section. To skip the next month’s payment, click Skip this payment. The auto payment will resume after the skipped month. To update the payment name, bank account or credit card, click Edit in the Scheduled Payments section. Update the necessary information, then click Update. To change the date the payment processes each month, you must delete and recreate the auto payment. Click Delete in the Scheduled Payments section, then return to the Home or Payments tabs to create a new auto payment. To completely delete an auto payment, click Delete in the scheduled payments section on the Home or Payments tabs. Click the Payments tab, then click View full account ledger to see a detailed ledger of all charges and payments posted to your account. Please contact your property manager if you have any questions about the transactions displayed. 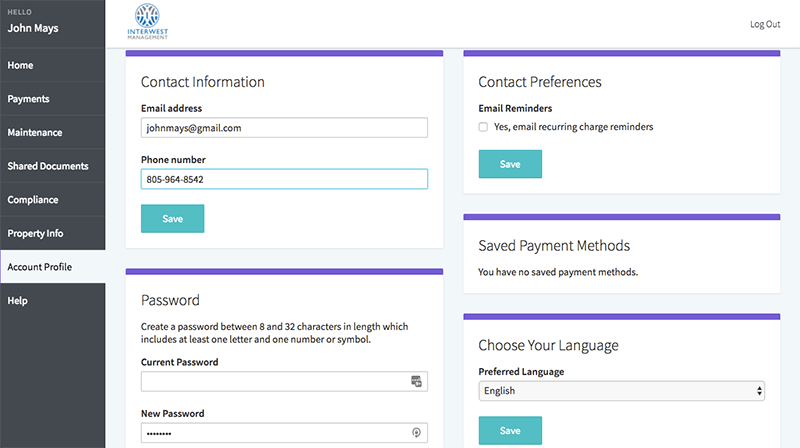 Email Address – Change the email address you use to log in to the Online Portal. Phone Number – Change the phone number your property manager has on file to contact you. Choose Your Language – Change the default language of your Online Portal to Spanish. Contact Preferences – Set up payment reminder emails to be sent to you 2 days before the 1st of every month. Saved Payment Methods – Delete a saved bank account or credit card. Password – Reset your Online Portal login password. Signature – Edit the electronic signature and initials used when signing lease documents online. Submit maintenance requests directly to your property manager along with photos of the issue. From the Home or Maintenance tab, click Request Maintenance. Enter a detailed description of the issue, upload one or more photos of the item needing attention (must select multiple photos at once from computer or camera roll), give the property manager permission to enter with their key, then click Submit Request. If you would like a copy of this request for your records, please contact your property manager. Check the progress of your request in the Maintenance tab. The status will update from received, to scheduled, to completed. There is no limit to how many maintenance requests you can submit or see in your Online Portal. If you feel there are some missing, please contact your property manager as it’s related to something they’ve done on their end. Your property manager can send important documents securely to your Online Portal. Access these in the Shared Documentstab. You’ll receive an email notification every time a new document is shared. If you signed a lease agreement online through your portal, you can view or download the completed lease documents from your portal at any time. Click Property Info from the menu on the left to view or download your online lease documents. If your property management company has enrolled you in Liability to Landlord Insurance, you will see a Notice of Liability to Landlord Insurance link in the Home and Property Info tabs. Click Notice of Liability to Landlord Insurance to view your summary of coverage. If you rent multiple units from your property management company, you can manage all of those units in a single Online Portal. You must receive a separate activation link for each unit. To view information or make payments for another unit, click View Another Unit, then click the button for the unit you wish to view. In my portal it says I can’t make online payments. Why not? Please contact your property manager, as this is a service they can choose whether or not to offer their tenants. How do I delete my saved auto payment? Your auto payment details are displayed on the Home or Payments tabs in the Scheduled Payments section. To delete the auto payment, click Delete. Can my property manager see any of my payment information? No. Your property manager cannot see any of the payment information you have saved or have previously entered. I no longer rent with this property manager. How do I delete my account? Please contact your property manager and ask them to delete the login information associated with your account. You can pay 2x your monthly rent charge or $3,000 in a single credit/debit card payment, whichever sum is greater. If 2x your monthly rent charge exceeds $10,000, you cannot pay more than $10,000 in a single payment. Please note, if your monthly charge amount increases or if you start paying for a new unit in the same Online Portal, the max allowed for a credit or debit card payment will not change. This only applies to payments made via credit or debit card, so you can switch to eCheck to pay a larger amount in one payment. If you would like to increase the max amount allowed to match your current monthly charge amount, please ask your property manager to contact AppFolio about the issue, but please know that your convenience fee will also increase. How do I update my electronic signature for signing documents? Update your electronic signature for signing documents electronically in the Account Profile tab of your Online Portal. Contact your property manager to learn about your payment options. In most locations, you are able to pay your rent in cash at a local 7-Eleven or Ace Cash Express. Your property manager can provide you with a unique and reusable payslip with a barcode to use when making cash payments at participating locations. The cost to make an electronic cash payments is $3.99 for up to $1,500.00 in cash. I have two (or more) Online Portals but I’d like to have them combined into one. How do I do this? Only your property manager is capable of combining your Online Portals, so please contact them directly to make this request. Your Online Portals must be managed by the same company in order to combine them.